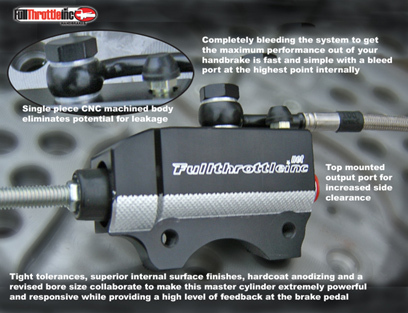 Fullthrottleinc has outfitted the nations top motorcycle stunt riders with handbrakes for the last 4 years. Champions such as Darius Khashabi, Jason Britton, Kane Friesen, the StarBoyz and countless others depend on Fullthrottleinc handbrakes to keep them stunting safely. A Fullthrottleinc kit puts a handbrake lever underneath your clutch to keep your wheelies under control. This is accomplished by installing the supplied handlebar mounted master cylinder and replacing the factory rear master with the billet Fullthrottleinc unit. Full use of the stock brake pedal is retained and you don't have to add an additional rear caliper. Simply run the steel braided brake line that comes with the kit from the Fullthrottleinc rear master cylinder to the handlebar mounted master cylinder and it's time to ride. Early this year Fullthrottleinc came out with a leak proof adaptor kit to bring you the performance of the famed billet rear master kit at a fraction of the price. 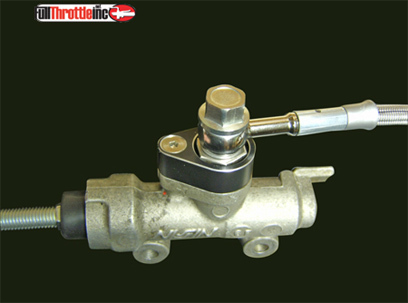 With this kit instead of replacing your rear master cylinder you are installing the Fullthrottleinc adaptor kit into your rear master cylinder. From the adaptor you run the included steel braided brake line to the handlebar mounted master cylinder under the clutch and you are in business. Either way you go you'll be enjoying the benefits of installing a professional level handbrake on your bike and taking your wheelies to the next level. To order one of these kits for your sportbike, call 877-785-7282 or go to www.fullthrottleinc.net. 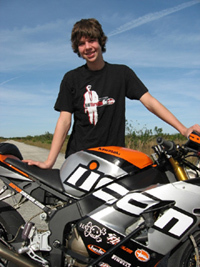 The billet rear master kit will be featured in the UpOnOne.com stunt bike build up, keep an eye out for a full review.